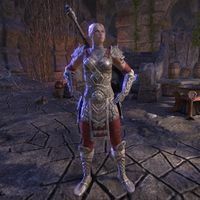 Lyris Titanborn was a Nord warrior with giant blood in her veins and personal bodyguard of Emperor Varen Aquilarios. One of the Five Companions, she was imprisoned in Coldharbour following the calamity known as the Soulburst. With Varen's disappearance during the event, she and Sai Sahan were suspected of murdering him and stealing the Amulet of Kings. In Coldharbour, she led the Soul Shriven in an uprising against their captors, and together with the Soulless One, they fought their way to save Lyris' friend and ally, the Prophet. She offered herself in place of the Prophet to enable him and the Soulless One escape from the realm. They eventually returned to save her, and the three banded in a quest to save Tamriel from the invasion of Molag Bal. She penned down the first three volumes of Chronicles of the Five Companions, which details the history of the group.